I've never minded the crust that runs along the edges of a slice of bread, but apparently eating crust or even seeing it attached to a sandwich causes much distress for some people. 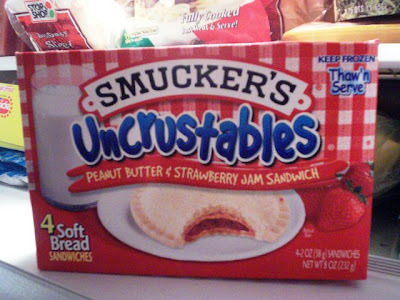 For fussy eaters like that, Smucker's has created a line of sandwiches without crust called - you guessed it - Uncrustables. Uncrustables ($2.99 at Stop & Shop) have always been a favorite at our house, and not because we despise crust. We're just too lazy to make a peanut butter and jelly sandwich. Not only do the sandwiches come with grape or strawberry jam, there is also a grilled cheese Uncrustable that you can warm up in the microwave. THE VERDICT: Yum! Because they're kept in the freezer until you're ready to eat, the Uncrustable bread is always soft, while the peanut butter and jelly inside is fresh and full of flavor. Mom thinks they're great, but she thinks some might find them to be a waste of money since you can just make a peanut butter sandwich at home for half the cost. 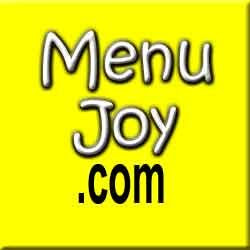 Also, if you are planning to eat one right away, putting it in the refrigerator to thaw is a good idea. However, do not store them there. We've done that and they became quite dried out.